Make The World Sound Better! This is the general motto of the International Sound Awards (ISA). At the International Sound Awards, we promote innovative and useful sound projects, products and services that contribute to our motto. 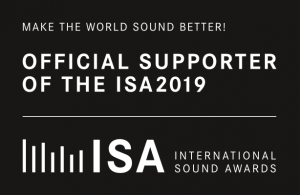 If you share our motto and want to support the initiative, then you should become an official supporter of the International Sound Awards 2019. By using the supporter badge in your own communications, you can share our common message with the world. If you have any questions or are interested in sponsoring opportunities, please send us an email.